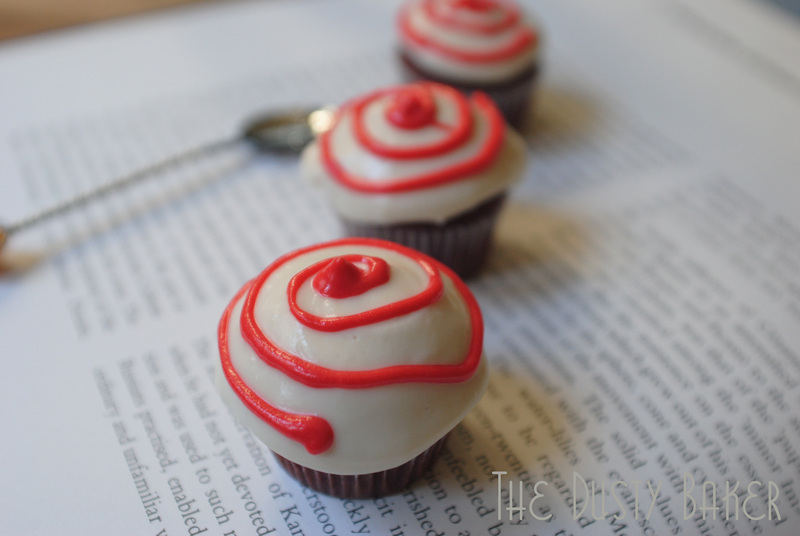 These little cupcakes are so divine and decadent and might I add so cute! I can’t wait to try to make these. Such a wonderful and cute post. Thanks! They are definitely a new favorite – thank god I was out of the house today and didn’t bring any with me! Hi Jacqueline, thanks so much for your support and encouragement! 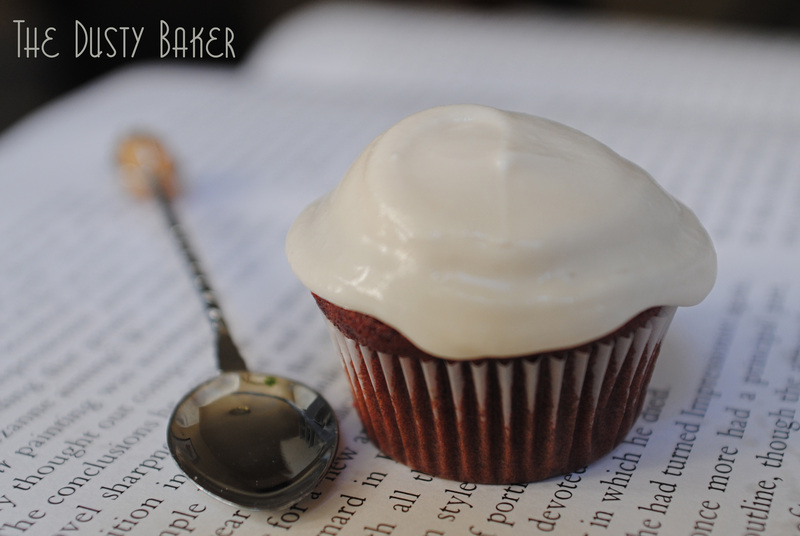 Wouldn’t you know it – I’ve been looking for a red velvet recipe for this month’s book. Coincidence? These are amazing. That frosting is incredibly tempting. I can’t imagine how actual got through frosting them all. Yum! I’ve eaten MANY cupcakes these past few days! And found an even BETTER frosting to douse them in! 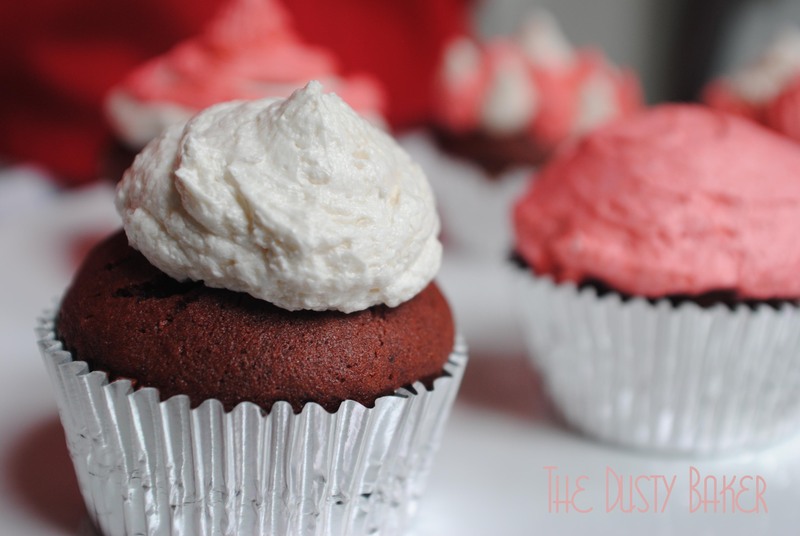 Those are so cute…I am loving the red touch on your cupcakes! Great recipe!! These looks so sweet and delish! Amazing job! These are so delightful!! I would love a dozen or so…. I ATE a dozen or so! And every time I popped one in my mouth literally threw an “oh my GOD” out there. They’re dangerous if you don’t have enough people to share them with! I’m guessing that 2 rounded tablespoons Tofutti “sour cream” should actually read 2 rounded tablespoons Tofutti “cream cheese”. Is thus correct? Nope, they make a sour cream too, which is what I use when a recipe calls for buttermilk. I couldn’t even lick the batter…I must have done something wrong…they smell and taste horrible. I used light agave nectar, which I think is the same as syrup? They are not sweet at all. Any tips for the very VERY non-glut. baking challenged?? And please email me at jacqueline@thedustybaker.com so I can fully make this recipe easier to follow. Thank you for replying as such!!!! Hi i’ve just put my cupcakes in the oven but i got a bit confused about the flour mixture u recommended. I used 1 cup arrowroot, 2 cups brown rice flour, 1 cup white rice flour and 1-1/4 teaspoons xanthan gum. Is this right? Jane; sounds like you mixed the flour mixture correctly but I believe you’re only meant to use 2.5 cups of that mixture in this recipe. The recipe seems delicious, I’m going to try it myself tonight!